The January 2015 Gemini Horoscope foretells that this month might not the correct time to be independent and aggressive in your approach. You should enlist the support of your friends and contacts while pursing your objectives and should adapt yourself to new situations. The horoscope 2015 predicts that the planetary positions in your birth chart are positive and will help you to overcome all challenges. You should keep away from your family and domestic concerns for the time being and should concentrate on your personal ambitions and growth. The Gemini monthly forecasts point to a difficult period till the third week of January 2015 in your job or business. Expect the situation to improve and progress to be made in the last week. 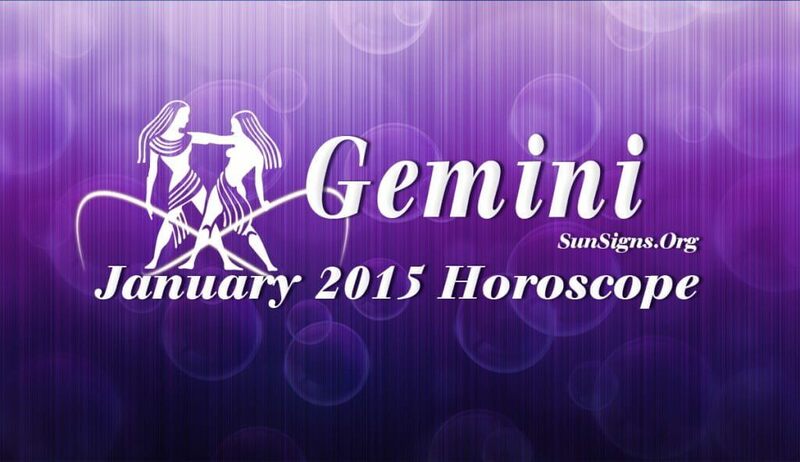 The Gemini 2015 January horoscope points to a complex situation during January 2015. Income will be generous till the third week of the month. Money from unexpected sources is likely and you will have more opportunities to improve your earnings. Love relationships for the Twins will be excellent in January 2015. This month offers many chances for singles to get into romantic alliances. Confirmed relationships will be highly volatile but passionate. Relationships with children might be strained. Family affairs for the Gemini zodiac sign will be normal till the middle of the month and will get better after that. Avoid conflicts with your spouse as far as possible. This might be a good month to plan for a child. The Gemini horoscope for January 2015 foretells that your health will be superb during the month and will improve as the month progresses. Harmonious relationships with family members will be beneficial for your mental and psychological health.